When Sue was visiting we went to Smorgasburg in Williamsburg. There was one kiosk with the longest line and even when it began to rain, no one moved. I had to see what they had. Corn, spread with butter and mayonnaise and coated in Parmesan cheese. I couldn’t wait to make it when I got home. Peel the leaves away from the corn. 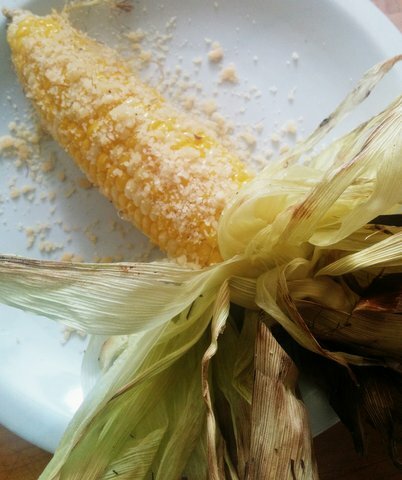 Brush corn with melted butter and replace the leaves. Barbecue for 20 minutes, turning every 5 minutes or so. When they are done, peel back the leaves, lightly spread with mayonnaise and dip into grated Parmesan cheese. Our sweet corn is done, but I hope to try this next summer! Okay, I know this might not be the healthiest recipe, but I’ll use organic mayo 😉 It looks so doggone yummy that I had to share it here!